I am very taken with Kyrgyzstan. Not only the majesty of the mountains and valleys and the warmth of Kyrgyz people, but the everyday, small things that make life interesting there. After spending six weeks in Kyrgyzstan in June/July, here are some of the things that took my fancy. Bus stop spotting can easily become an obsession in Kyrgyzstan. 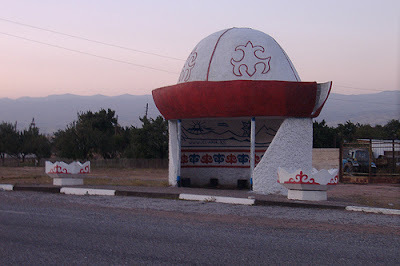 Dotted on the main highways and country roads, these bus shelters did not follow an austere, Soviet model. Instead they are a riot of mosaics and murals depicting Kyrgyz mythology and patterns as well as patriotic themes from Soviet times. 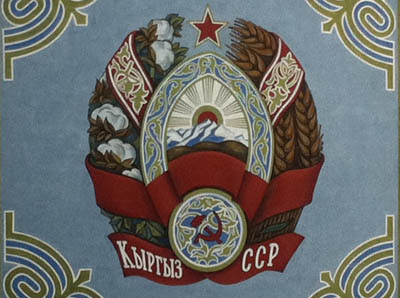 The image above right is a marvellous example: it is shaped like the Kyrgyz national hat for men, the kalpak. It symbolises the snowy peaks and vitality of this mountainous country. Unfortunately, there seems to be no bus shelter maintenance these days, and the marvellous structures are slowly crumbling. What a pity - such a great slice of social history. Visit Kyrgyzstan while you can to still see these shelters! Check out Steppe Magazine's first issue as there was a Top Ten feature of bus stops in Central Asia showcasing Christopher Herwig's fabulous images. Despite assurances that there was a 3 rouble coin in Soviet times, having only ever known 1, 2 and 5 unit small coins, I was fascinated by the Kyrgyz 3 soum coin. I loved having them in my wallet and producing four of them to pay for a 12-soum night ride on a marshrutka (local collective mini-bus). This quirky little building is located behind the Tsum department store, adjacent to the Opera House. In Soviet times, it was known as Rakushka (Shell). Rakushka is a classic example of Soviet modernist style, designed by architects V. Krugman and R. Muhamadiev as a souvenir shop. Even in perestroika years it continued as a souvenir shop and only after independence was it converted to a café. On a summer's day there is a terrace and shade. The menu is in Russian, but there are English speaking staff. There is lots of graffiti in the city. That in itself is unusual in Central Asia. Some of it is tedious tags. But there is also some interesting work on the city walls. Political street art abounds, though regrettably most of the commentary of course in Cyrillic. This painting at left of an alpine scene with lake, possibly of Issyk Kul, was done with immense care, in oil, in an underpass I walked through daily. When I finally returned to photograph it, the painting itself had been tagged. Architecturally, Bishkek is quite drab, and much of the street art enlivens the cityscape. There are now some established street artists commenting on social and political issues, and evidently street art festivals are part of the Bishkek calendar. Unlike other Central Asian republics, Kyrgyzstan has not *deleted* its Soviet past. Lenin still stands in the centre of Bishkek, albeit he is now moved behind the State History Museum. A Marx and Engels sculpture is nestled in nearby Oak Park. When buildings are restored, reminders of Soviet times are restored as well. This is beautifully demonstrated in Bishkek's main railway station's arrival hall. The ceiling is glorious: the centre rosette is of traditional traditional Kyrgyz patterns wrapped in a Kyrgyz SSR ribbon. Mikhail Frunze, the Bolshevik leader just prior to the 1917 revolution and once considered a successor to Lenin, was born in Bishkek. (Indeed the city was known as Frunze, in his honour, from 1926 - 1991. Luggage is still tagged to FRU when you fly to Bishkek). The Frunze Museum in Bishkek is fascinating and the State History Museum's second floor is devoted to Lenin and the Russian revolution. I had stocked up on gorgeous felt/silk shawls, tops and gloves at Aidai Asangulova's felt workshop and decided to post a box of goodies home. EMS (Express Mail Service), though expensive, seemed the most reliable. The EMS office is open seven days a week and I had hoped to purchase a box there, fill it, complete the customs form, pay and be on my way. But it was nothing like that. The very helpful staff in the EMS office requested that I write a list of every item to be mailed, which they then checked against the contents. Then they measured the dimensions of my pile and proceeded to sew a sturdy bag of thick calico for my goods. After addressing the bag and attaching customs forms, the tailor-made sack was sealed in hot wax, which was also on hand. Even with a Russian speaking friend with me, this took about 90 minutes. Nevertheless, it was excellent service and the sack arrived at my home, looking like a Christmas pudding, two weeks later. The fee for making the sack was about $1. Evidently the Tashkent Post Office provides this same "sew and seal" service. Apart from the efficiency of this operation, it was all done with legendary Kyrgyz courtesy and grace.